After a weekend that saw Darley's impressive Elusive Quality (TrueNicks,SRO) colt Sepoy take the Golden Slipper (gr. 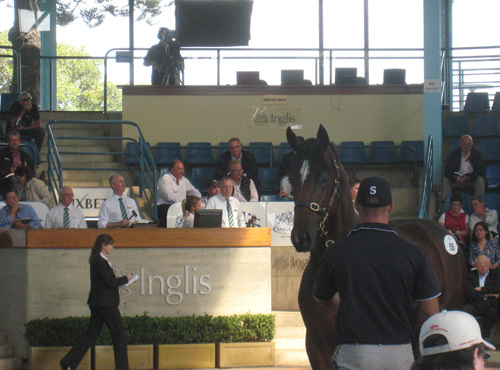 I), the Inglis Easter yearling sale got underway on April 5th. Lot 226, a filly by Redoute's Choice out of Dowry (Bahhare) sold to Anton Koolman Bloodstock for $500,000. The Inglis venue at Newmarket is not an expansive property—certainly not approaching Keeneland's acreage—but it is highly functional, with consignments intimately bunched amidst nearly-full-service hospitality tents offering breakfast, lunch, and coffee to all comers. Arrowfield's tent is particularly impressive: plush sofas, stallion murals, and baristas serving all café desires complete with the occasional latte art. With the sun shining and a cool breeze rolling in, yearlings seemed to spend more time on two legs than on four. This colt by Encosta de Lago out of Bruges (Groom Dancer) failed to sell for $360,000. 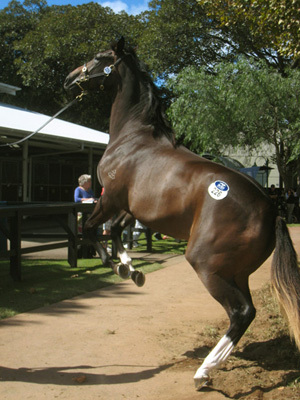 Through the first two days of the sale, Redoute's Choice offspring dominated proceedings. 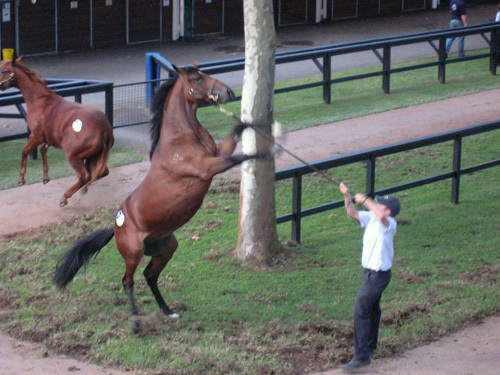 He had four of the top five lots, including a $1 million filly from the family of Canny Lad. This was bettered only by the $1.025 million Casino Prince half brother to Black Caviar sold to Hawkes Racing. One that caught my eye was lot 58, a stunning High Chaparral (IRE) (TrueNicks) colt out of a Volksraad mare. High Chaparral is riding the wave of a breakout season that included group I-winning males So You Think, Shoot Out, Monaco Consul, and Descarado. This colt went to Anton Koolman (he also bought the $500,000 Redoute's Choice filly) for $750,000, reportedly for a client in Hong Kong. The $750,000 High Chaparral colt strikes a pose in the ring. 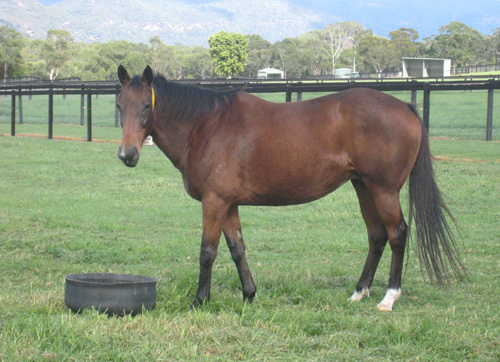 Samantha Miss, by Redoute's Choice, won three group I's and ran third in the Cox Plate (gr. I) as a 3-year-old, solidifying 2009 champion 3-year-old filly honors. 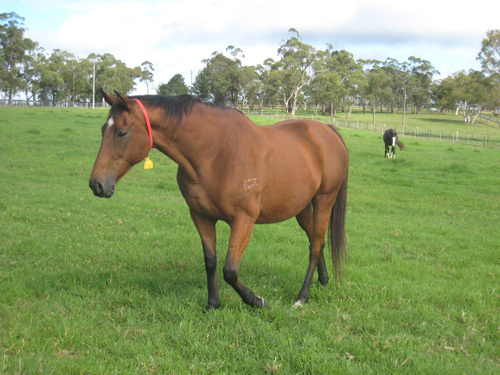 Ha Ha, by Danehill, won the 2001 Golden Slipper (gr. 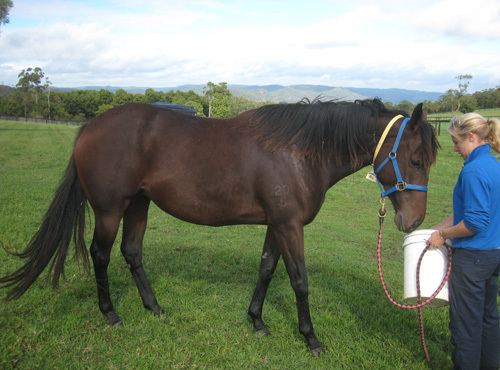 I) and went on to be named 2002 champion 3-year-old filly. Sunday Joy, by Sunday Silence, won the 2003 AJC Oaks (gr. I). Bred to More Than Ready (TrueNicks,SRO), she produced the incredible More Joyous, winner of five group I's to date who starts next in Saturday's Doncaster Handicap (gr. I).